CE Broker is the official continuing education system for the Florida Department of Health and the District of Columbia Board of Nursing. Manage your continuing education, search for approved courses, and more! http://www.CEBroker.com. Florida Chiropractic Physicians, March 31 is fast approaching! We want to give you a quick visual of all of your CE requirements so you don’t have any surprises when you are renewing your license. Keep reading below to learn more about your 2016 biennium requirements. And remember that ALL of your CE must be completed in person. No home study allowed. Remember that all courses must be approved by the Florida Board of Chiropractic Medicine! We are dedicated to helping you successfully renew your license so we have plenty of tools for you to utilize if you have any questions! We have added a special FAQ section just for Chiropractors in our Support pages. To read over those, click here. For your ultimate worry-free, personalized solution try our 7-Day Trial for our Professional Account. With your Professional Account you can receive notifications of license deadlines, report CE to your account, access to your CE Compliance Transcript and more to simplify your renewal process. Florida Osteopathic Physicians, March 31 is fast approaching! We want to give you a quick visual of all of your CE requirements so there aren’t any surprises when you are renewing your license. Keep reading to learn more about your 2016 biennium requirements. * Licensees must obtain 2 hours of Domestic Violence every third renewal period as part of the 40 hours required. CE Broker is dedicated to helping you successfully renew your license. We have plenty of tools for you to utilize if you have any questions! We have added a special FAQ section just for Osteopathic Physicians in our Support pages. To read over those, click here. If you are a Podiatric Physician in Florida, then you are getting ready to renew your license. March 31st, 2016 is your big day! We want to make sure that you are aware of your specific renewal requirements. Continue reading below to find your biennium requirements for Podiatric Physicians and Podiatric X-Ray Assistants. Podiatric Physicians initially licensed in the biennium or within 24 months of initial licensure must attend one full day at a Florida Board of Podiatric Medicine meeting at which disciplinary hearings are conducted. Each healthcare profession in Florida will vary on what credits count towards your compliance. Below are some “Did You Know” facts specific to Podiatrists. CE Broker is dedicated to helping you successfully renew your license. We have plenty of tools for you to utilize if you have any questions! We have added a special FAQ section just for Podiatrists in our Support pages. To read over those, click here. What happens to my account after renewal? So you just renewed your license and you’re clear for another two years to practice. Congratulations! Let’s say it’s just before your license expiration date of February 28th, 2016 (this is an arbitrary date, your actual license expiration date is probably different). You log in to your CE Broker Account and see a compliance status that says complete. So you renew your license and all is good. After you renew successfully, we then get the new license cycle from your board. Once we get the next biennium in our system from your board, we immediately reflect that data in CE Broker. When you log in after your new license cycle starts, your compliance status will show not complete. There is no need to freak out if you see this! Our system has simply updated to reflect the information for the most current license biennium that we received from your board. You are now not complete for your new biennium. This does not mean that you are delinquent. We will always show the status for the most current license cycle and your information constantly builds upon itself. If you have any questions about your CE Broker Account or your compliance, please reach out to our CE Experts at 1-877-434-6323. 4. If you had the day off of work, what would your ideal day look like? What would you spend your time doing? Going to the beach or running to the mall WITHOUT my kids . 7. What aspect of your job as Support Center Expert do you enjoy the most? The flexibility and the satisfaction that I can help someone have a better understanding of their requirements. 2. How long have you been with CE Broker? Since December 2015. 3. What’s your specialty/expertise as a CE Expert? Giving great customer service with accuracy. 4. If you had the day off of work, what would your ideal day look like? What would you spend your time doing? Shopping, cooking and baking. 5. If you could have any super power, what would it be? To cure the world from poverty. 6. What’s on your bucket list? Traveling to many countries, like Japan, South Korea, France, England and going on cruises. 7. What aspect of your job as Support Center Expert do you enjoy the most? Everyday I learn something new, the wheels of knowledge are always turning. 8. What’s your favorite movie? I have a huge list, I’m a big fan of 90s comedies like Acne Ventura Pet detective, then I’m huge into a lot of Quentin Tarantino films like Pulp Fiction and Kill Bill. 4. If you had the day off of work, what would your ideal day look like? What would you spend your time doing? Sleeping in and then a lazy day at the beach! 7. What aspect of your job as Support Center Expert do you enjoy the most? Having the opportunity to help others. February 28th, 2016 is the day that Florida Acupuncturists will be renewing their licenses. We want to give you a quick visual of all of your CE requirements so you don’t have any surprises when renewing your license. The following chart contains all of the 30 total hours required for Florida Acupuncturists. Keep in mind that you your Medical Errors course MUST be board approved. If you are renewing your license for the first time you are only required to complete 2 hours of Medical Errors and 3 hours of HIV/AIDS. If you need to complete an HIV/AIDS course, Medical Errors or if you need to complete other required subject areas, you can find approved courses in our Course Search Tool. 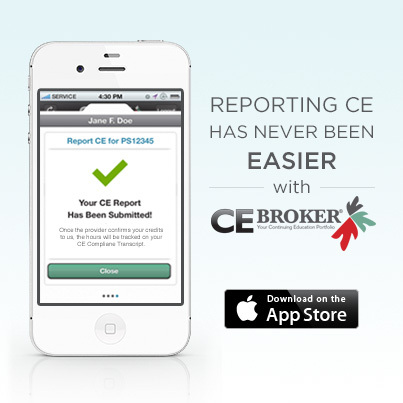 Our free CE Broker iPhone app, available in the iTunes Store, is the best way to manage your CE from anywhere, anytime. You can create a free Basic Account and even upgrade to a Professional or Concierge account with your iTunes account if you so desire. That means no credit card is required since your iTunes account on file is automatically charged. Once you download the iPhone app, you can see your course history, report CE, use the course search tool and even view your CE Compliance Transcript. Visit the iTunes Store today and download for free! We are dedicated to helping you successfully renew your license so we have plenty of tools for you to utilize if you have any questions! We added a special Florida Board of Acupuncture section just for you Acupuncturists in our Support pages which includes all of the most commonly asked questions from other licensees in your profession. To find a specific course to fulfill any unmet requirements, you can watch our Course Search video by clicking on the picture below. February 28th, 2016 is the day that Florida Dentists, Dental Hygienists and Dental Laboratories will be renewing their licenses. We want to give you a quick visual of all of your CE requirements so you don’t have any surprises when renewing your license. The following chart contains all of the 30 total hours required for Florida Dentists. Keep in mind that you MUST complete 2 hours of Domestic Violence every third biennium. If you aren’t sure if this is the biennium in which you must complete your Domestic Violence requirement, sign up for a Free Trial of a Professional Account to view your CE Compliance Transcript. It will display all of the CME requirements that you need for 2016 and even show you what you are missing! The following chart contains all of the 24 total hours required for Florida Dental Hygienists. 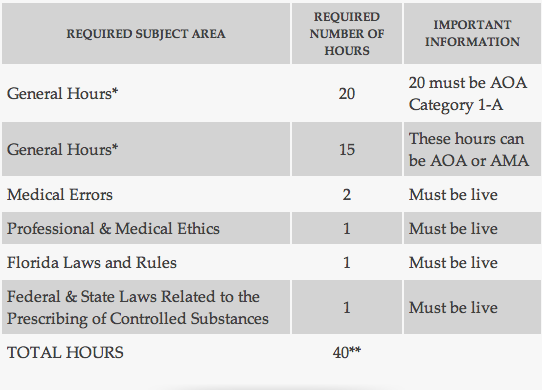 The following chart contains all of the 18 total hours required for Florida Dental Laboratories. Dentists and Dental Hygienists– If you are newly licensed and renewing your license for the first time you are only required to complete 2 hours of HIV/AIDS. Dental Laboratories – If you are newly licensed and renewing your license for the first time you are required to complete 18 hours as stated above in your requirements chart. If you need to complete an HIV/AIDS course or if you need to complete other required subject areas, you can find approved courses in our Course Search Tool. We are dedicated to helping you successfully renew your license so we have plenty of tools for you to utilize if you have any questions! We added a special Florida Board of Dentistry section just for you Dentists, Dental Hygienists and Dental Laboratories in our Support pages which includes all of the most commonly asked questions from other licensees in your profession. To find a specific course to fulfill any unmet requirements, you can watch our Course Search video by clicking on the picture below. 2. How long have you been with CE Broker? 1 month and loving it! 3. What’s your specialty/expertise as a CE Expert? 4. If you had the day off of work, what would your ideal day look like? What would you spend your time doing? Sitting on the bridge catching all the big fish…not fishing…catching! 7. What aspect of your job as Support Center Expert do you enjoy the most? Managing a business-minded and hard working team!